Many people in Russia’s “northern capital” do not live in standard apartments, but in palaces, or rather former palaces, known as kommunalki, or communal apartments. Pre-revolutionary interiors and humdrum existence are depicted through the eyes of Maxim Kosmin, blogger and founder of the online community Old Fund. St. Petersburg is home to the largest number of communal apartments in Russia. These huge premises with multiple rooms and communal corridors, kitchens and bathrooms still stand on every corner. According to data for 2015, there are about 85 thousand such apartments in the city. After the 1917 revolution, the Bolsheviks took the apartments of rich people and turned them into kommunalki: they divided up the living space and increased the number of occupants per apartment, packing in as many families as possible. The walls were repeatedly moved around, so today you can often see the remnants of a carved wooden ceiling in a standard closet. Interiors of pre-revolutionary St. Petersburg are collected and posted online by the community Old Fund. “It's quite possible that these apartments will fall into ignorant hands, so our photos are intended to preserve the memory of the past,” explain the project members. For the project founder himself, Maxim Kosmin, communal apartment interiors are a hobby. As a child, he lived on the outskirts of St. Petersburg in a normal apartment, but moved into an 'old fund' a few years ago because he wanted to live in an old building with high ceilings. Communal apartment interiors are the best preserved because residents are awaiting resettlement and do not renovate them, says Maxim. “Renovate” in Russia usually involves razing to the ground and rebuilding everything anew. Some aspects, of course, fall into disrepair, since communal life takes a heavy toll on interiors. But “euroremont” (European-style renovation) destroys them even more, he says. Maxim finds and posts on Instagram pictures of vintage ovens, ceiling moldings, former ballrooms and walled-up doors. 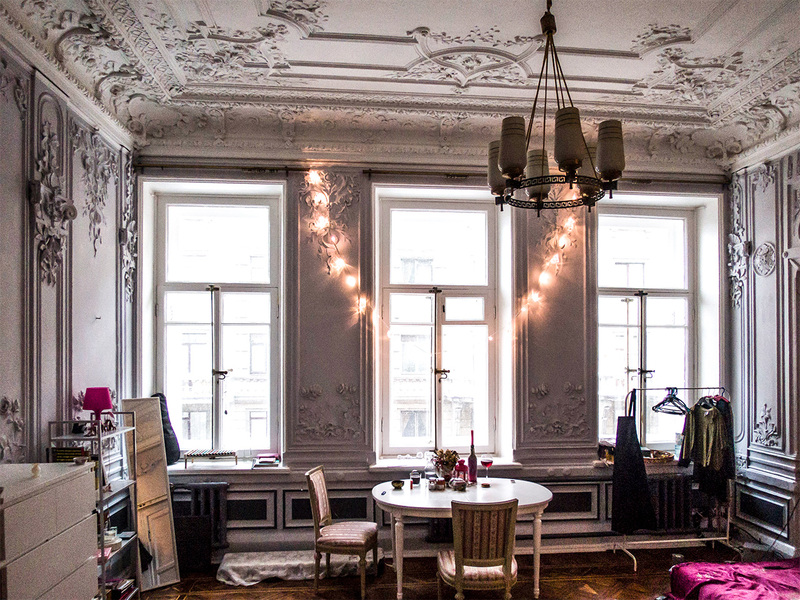 The interiors of one of St. Petersburg's most famous kommunalkis, at 11 Suvorov Street, for instance, date back to 1904. According to The Village, the apartment may once have housed a theater, since inside is a plinth-shaped object. The tenants initially assumed that the beautifully carved ceiling was made of wood, but a few years ago it collapsed. It turned out to be plaster of Paris. Sometimes Maxim gives tours of the city’s most beautiful communal apartments. Sign-up is exclusively via Instagram. The routes and meeting place are kept secret, as are the addresses of the abandoned buildings with beautiful interiors, the simple reason being to protect the antique stained-glass windows and fireplaces from looters. The Old Fund project boasts many kommunalki with famous former residents. For example, Rasputin had an apartment here. There is no beautiful stucco, but pre-revolutionary newspapers were discovered under the layers of wallpaper in this austere apartment. One historical feature of this apartment to have survived is the back door used by Rasputin and his killer Felix Yusupov. A century ago, on the night of Dec. 30, 1916, they left through this door and headed for the Yusupov Palace on the Moika River. A few hours later Rasputin was murdered. After the revolution, Rasputin's five-room apartment was turned into a kommunalka, which is now almost fully occupied. According to Maxim, the last resident bought a room precisely because of the link to Rasputin. He is an artist and paints portraits of the mad monk in the apartment. "Kommunalki breed a certain type of psychology. It was not uncommon for people to refuse to move out because they needed the companionship and interaction that came from living in such a place, even the antagonism and adrenaline," says historian Yuri Kruzhnov. "But nowadays most residents have a negative attitude towards kommunalki."